National Parks, State Parks and more! Utah's southwest is a land full of breathtaking vistas and striking formations, and you'd be hard pressed to find a better place to explore it from than Kanab. With national parks and recreation areas in every direction, lovers of the outdoors could spend weeks in this area without exhausting the possibilities for hiking, scenic drives, camping, or mountain biking. For starters, there's the sprawling Grand Staircase of the Escalante National Monument, an enormous area of sandstone cliffs, rugged plateaus, and winding unpaved roads. Head a little farther east and you'll come to Lake Powell, whose scenic finger canyons are loved by boaters and anglers. Travel south and you'll come to the North Rim of the Grand Canyon; on the west is the noble grandeur of Zion National Park; to the north you'll discover the arches of Bryce Canyon and the sharp spires of Cedar Breaks. Everywhere you look, there's something new to see. The massive cliff walls of granite that tower above the canyon floor at Zion are truly epic. Geological processes have produced majestic features with names like the Great White Throne, the Temples, and the Altar of Sacrifice. Zion is a popular southwest destination, and for good reason. The scenery here is awe-inspiring. Bryce Canyon National Park is home to a series of colorful and intricate rock forms carved by erosion from the edge of the Pausaugunt Plateau. An easy scenic drive runs along the top of the plateau to wonderful lookouts over the park. Numerous hiking trails run along the rim and down among the rock forms. Lake Powell stretches through almost 200 miles of southern Utah, with a seemingly endless chain of side canyons and beaches. The lake is popular for its houseboat vacations and captivating scenery. Escape the crowds at the isolated and hauntingly beautiful North Rim of the Grand Canyon. With only a tenth the visitation of the South Rim, the vistas on this side of the canyon are equally spectacular and just as unforgettable. 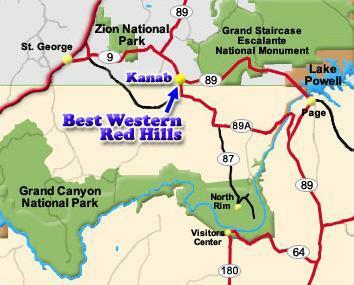 The Grand Canyon National Park North Rim is just a short drive away from the BEST WESTERN Red Hills. 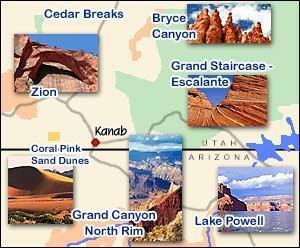 Kanab's convenient central location allows you to easily visit Zion National Park, Bryce Canyon National Park, Grand Staircase Escalante National Monument and Lake Powell. Make BEST WESTERN Red Hills your base for exploring the national parks and monuments of Southern Utah and Northern Arizona. Great rock chimneys capture the changing colors of the sun and sky in this photogenic part of the state. Campgrounds and hiking trails allow visitors to appreciate the unique formations. Designated just a few years ago, this enormous area of southern Utah is wild and undeveloped. Much of the monument is accessible only on foot or in a four-wheel drive vehicle. Cottonwood Canyon Road or Hole-in-the-Rock Road are two spectacular drives for high-clearance vehicles that travel into the heart of this pristine region. Here you'll find a wide plain of bright reddish-pink sand dunes, dotted with wildflowers and wind-swept, low-clinging shrubs. Coral Pink Sand Dunes is a favorite spot for hiking and photography. Thank you for visiting http://www.bestwesternredhills.com/Area-Attractions! Be sure and revisit bestwesternredhills.com frequently for content updates and more.